I made this card for last weeks Inspiration Challenge (IC172) on Splitcoaststampers.com (SCS). 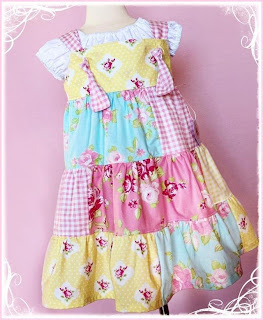 My inspiration piece was this dress from 'Little Daisy Designs.' To make the card, I created a 'Patchwork Quilt' look by cutting up and mixing together two different designer papers (unknown). The flowers were made using the retired Stampin Up! set 'So Many Scallops' and the Scallop Punch. I mounted them up on dimensionals and added buttons and floss for embellishment. I hand cut the stems using Wild Wasabi Card Stock. Ink Colors are Regal Rose and Pretty in Pink. Other Card stock colors used are Bashful Blue and White. It says 'Thank you' on the inside of the card. I have a lot of pictures and stories to tell about my trip to Chicago this weekend, but that will be a very long post, and I just don't have time for it now. Tomorrow and Wednesday I'm back to work, so hopefully on Thursday I'll have some time to share my wonderful adventure. This is really too adorable! The flowers alone would have been cute, but that patchwork background makes this extra special. Great job with the challenge. This is so cute Amy! I love your patchwork quilt background and your focus flowers are perfect! Can't wait to hear about your trip and see some photos! Have fun at work ... is it going a little better?? Hope so!